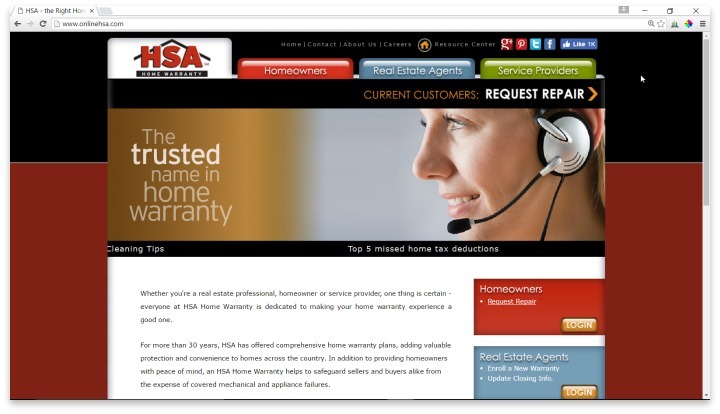 HSA is a home warranty provider that has been in operation since 1984, and is headquartered in Wisconsin. Since their very inception, HSA has focused on providing the right home warranty for a specific homeowner, rather than just being another voice in the crowd trying to underbid the competition. To that end, HSA has always tried to employ the most knowledgeable and well-trained team members to offer customer support along the way. They are currently rated a B on the BBB, where they have been active since 1990. HSA Home Warranty seems to be a company that used to have a great reputation and friendly service, but has recently lost its way. They offer two types of home warranties – one for owners, and one for buyers or sellers who are involved in an upcoming or current transaction. The second is simply a temporary version of the permanent homeowners’ warranties. Warranties start with a very basic plan to protect your heating, ductwork, plumbing, electrical systems, appliances, and various other basic features of a house. Plans are all based on where you live, so prices can be significantly higher for certain homeowners, even if they choose the basic plans. After the basic plan, there are upgrades that can be purchased to cover more specific items, such as code violation reimbursement, septic systems, roof leaks, swimming pools, and other features. To illustrate how the price can vary greatly from state to state, consider that the current cost for a basic plan in Missouri is between $400 and $450, while the same services in Maine can be as much as $530. Additionally, HSA warranties are not available in every state. Customer service seems to be a truly hit or miss situation with HSA. In the last three years, there have been 525 complaints opened with the BBB, which have resulted in HSA losing their previous A+ rating. Of these complaints, the most common was a problem with the services themselves. Users frequently report repair workers or service workers never showing up, but being billed for the work regardless, or claims being closed without ever having been addressed. There are also reports that automatic renewals for warranties have happened after warranties were canceled. Many, if not most, of the user reviews for HSA mention how difficult it is to get in touch with customer service, with long hold times and frequent disconnects being the two main complaints. HSA offers a phone number and an email contact form for customer service, but their cluttered website is not the easiest to navigate at first sight. HSA Home Warranty offers two types of home warranties – one for owners, and one for buyers or sellers who are involved in an upcoming or current transaction. Once, HSA was likely a great option for home warranty coverage. Their easy-to-understand coverage policy, and their reliance on a network of partners around the country, indicate that they did have a great business model. However, the ongoing trend of bad customer service and negative handling of claims and services indicates that HSA is on a decline. If you want to purchase a home warranty, and you want to be sure that you are truly getting value for your money, HSA is probably not the best service to choose. The only exception would be for sellers and buyers who just want to grab a quick, temporary policy to cover them for a short 6-month stint while they sell or purchase a house. Have you had an experience with this company? Please share your HSA Home Warranty reviews below. Realtors quit recommending these services for your transactions. They are not value added. Here is how they work. I had a refrigerator that died a couple of months into the warranty. The company said it would be two weeks before they could get someone out. Who can wait for two weeks for someone to come out and look at the unit and then wait for the parts to come? No one and the company knows this. They do this on purpose to force you into having it fixed outside of their contract. I had to go and buy a new fridge at the store and install it myself. I have two kids. What family can live without a fridge for weeks? The second incident is that I had a septic pump go out. I had sewage running down my lawn for weeks. They sent the call to a company who never showed up. I called again and they sent someone else, who also never showed up. I called 4 times to get some help and was on hold for over an hour each time only to give up. I ended up repairing that as well myself. Who can have raw sewage running into their yard for a month? Any idea how much sewage that is with a famiy of four and one being a 13 year old? I was terrible and a serious health hazard. They then blamed me for not calling. This company has bad business practices and does not honor their contracts through customer avoidance. DO NOT TRY AND INCLUDE IN YOUR TRANSACTIONS. Do your clients a favor.